Let’s be honest, most of us Fast & Furious fans and Need for Speed fans will never get the chance to drift around the streets of London. Street racing is, of course, dangerous and illegal, but that doesn’t mean the rivalry among me and my friends over who’s the better driver can’t be resolved. The way we did it was to burn some rubber at the Capital Karts circuit, which is in Barking and open seven days a week. We booked our session for 5pm and with a selection of offers for track time we chose the exclusive hire option as there were 11 of us. The cost worked out as £60 each. The exclusive track hire offers over 60 minutes of racing time, and you have to be at least 16 years old – so fresh-faced racers should bring some ID along. Capital Karts is the UK’s longest indoor karting track at 1,050 metres. The circuit is designed to replicate F1 venues, with the safety barriers and sharp bends. 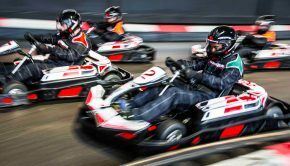 Voted Best Indoor Karting Track of 2015 by readers of Karting magazine, Capital Karts also claims to have the fastest go-karts in London – their 270cc machines can hit speeds of up to 45mph. But before we were let loose behind the wheel, we took part in a safety briefing, received our helmets, and carried out a few practice laps to get a feel for both our karts and the track. Driving a kart is very different to driving a car. The steering is more sensitive and they are much nippier. I couldn’t resist a cheeky drift which made me think I was in a Fast & Furious movie for a split second. A great advantage I had over my friends is that I only weigh 77kg, which allowed my go-kart to hit top speed quicker than my heavier mates. The disadvantage of me being the lighter racer was that I had less of a grip on the track, so when it came to sharp bends I lost speed, which allowed my mates to catch up. A valuable lesson I learnt is always find a way past slow drivers as you will only drive as fast as them. The track is tight, so be prepared to come across frustrating situations such as being obstructed. A great technique I figured out is to get as close as possible to the driver in front then try accelerate past them on the inside when going through a bend. The more time you spend behind someone, the more you lose touch with the leaders, and the drivers behind you start to catch up. After that, I asked one of the staff for tips which I found that helped me in the second race. He told me I was losing speed on the bends as I wasn’t braking correctly, and getting overtaken as a consequence. Most my friends who finished in the top five were the more aggressive drivers; one actually caused someone to spin out when the back of his kart was clipped and eventually he finished last. However, reckless driving is not tolerated and you will receive a warning before being dismissed. In my second race, I managed to finish third, putting into practice the advice I’d been given but also being meaner and obstructive to the racers behind me. Driving as if you have eyes in the back of your head is very important, especially near the end when you want to defend your position on the track. I highly recommend go-karting if you’re looking for an exhilarating and competitive racing experience with your friends. If you’re interested in racing at Capital Karts, visit their website.